Vacation rental cottage. Sleeps 10, 3 bedrooms, 2 bathrooms. No pets allowed. Front porch. View of Back River from here! Distance view of great screened in side porch! Welcome to "Flips" Flop circa 1926! 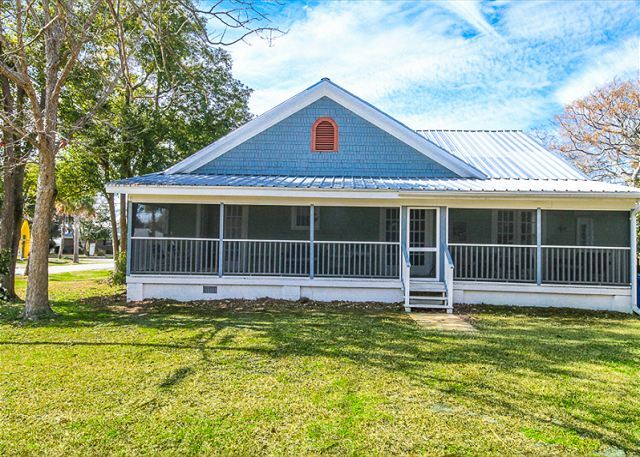 Fully restored historic Tybee beach cottage! View of Back River from front porch! Full of vintage charm & details! Expansive screened in side porch! Lots of seating and perfect place to have your Mermaid Morning Bliss coffee or evening cocktails! Side patio, grill, bike rack and outdoor shower. Bedroom #1 with queen bed and flatscreen TV. Fun, coastal bedding and French doors opening onto the huge screened side porch! Lots of porch seating! Beautiful, comfy living room with lots of seating and flat screen TV. Lots of beachy accents! Fun colors and décor! Bedroom #2 features a queen bed with French doors out to the screened side porch. Bright, sunny yellow! Second bathroom features black/white tile with black/white/green color scheme & toile shower curtain. Full bath/tub. Welcome to "Flips" Flop House circa 1926! 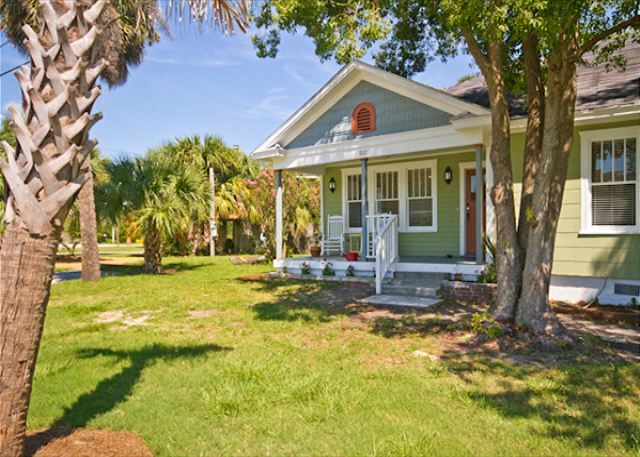 Fully restored historic Tybee beach cottage! View of Back River from front porch! Full of vintage charm & details! 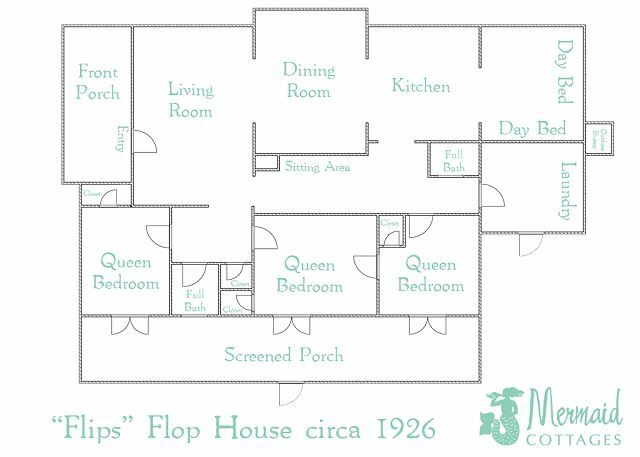 Welcome to "Flips" Flop House c1926! Side garden and driveway. Another view of screened side porch. French doors from living room into dining room which features an oval dining table with seating for 8! Brand new kitchen with open shelving and stainless steel appliances including dishwasher! Daybeds; dining area off of kitchen featuring a round table with seating for 4, 2 daybeds w/ trundles (4 twins), and a small flatscreen TV. Great for kids' dining, napping and play area! Hall bath features black/white tile with a black/white/green color scheme and toile shower curtain. This is a full bath/shower. Daybed and dining area off of kitchen featuring a round table with seating for 4, 2 daybeds with trundles (4 twins), and a small flatscreen TV. Great for kids' dining, napping and play area! Daybed & dining area off of kitchen featuring a round table with seating for 4, 2 daybeds, and a small flatscreen TV. Great for kids' dining, napping & play area! Daybed & dining area off of kitchen featuring a round table with seating for 4, 2 daybeds with trundles (4 twins), and a small flatscreen TV. Great for kids' dining, napping & play area! Hallway features a long, cane-bottom bench. Bedroom #3 features a queen bed and flat screen TV with French doors out to the screened side porch. Spacious laundry room. Brand new washer/dryer. Door from laundry room leads out to side patio & yard. Welcome to Flips Flop House!. 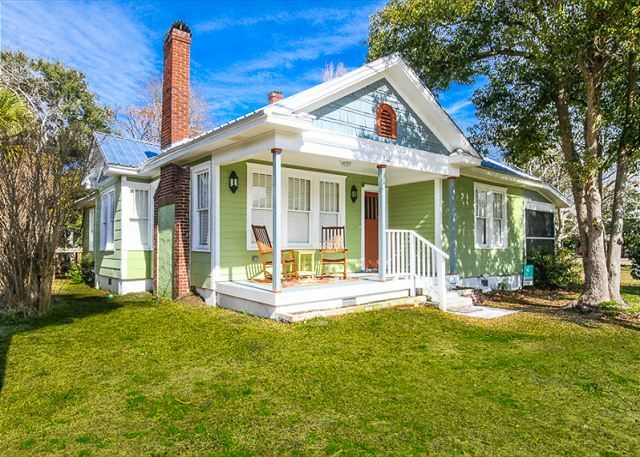 A wonderfully-restored historic Tybee beach cottage with authentic antique fixtures and historic designation of Tybee Island Historical Society Preservation Award! A true Tybee gem! Sleeps 10. All coastal-inspired décor!! Living room features authentic hardwood floors, beautiful chandelier and comfortable seating (2 sofas!). A brick (non-working) fireplace. Large flatscreen TV mounted above the fireplace. Rooms are painted a bright, sunny yellow throughout and all bedrooms feature ceiling fans and bright, beachy linens and décor! French doors open from the living area into the dining room which features an oval dining table with seating for 8. Wonderful china cabinet. This dining room leads into the brand new kitchen with open shelving and stainless steel appliances including dishwasher. Kitchen is small and cozy leading into a sitting area featuring 2 daybeds with trundles (4 twins). (No door separating this room from kitchen; curtain between the 2 rooms). This area includes a small flatscreen TV. Great area for kids’ dining, napping and play! Hallway features a long, cane-bottom bench. First bedroom features a queen-size bed with small flatscreen TV, ceiling fan and French doors opening onto the awesome side screened porch! Hall bath features black/white tile with a black/white/green color scheme and toile shower curtain in black and white. This is a full bath with shower. Second bedroom features a queen bed. Second full bathroom features the same black/white/green color scheme as the first and also includes a tub (one shower has handheld and not overhead showerhead). Third bedroom features a queen-size bed with fun, beachy décor and flatscreen TV. All 3 queen bedrooms have French doors opening onto the expansive screened-in side porch. Spacious laundry room with brand new washer and dryer. Door from laundry room leads out onto side patio and yard. Side yard features a charcoal grill and a wonderful, newly-constructed outdoor shower with hot and cold water (perfect for showering off beach sand and saltwater before heading indoors!) and a newly-constructed bike rack! Side yard beside driveway (on opposite side of house from the side screened porch and outdoor shower) features a great side garden with heron statuary; gorgeous! House features wonderful front and side porches with ample, comfy seating! The side porch is newly-screened in and is the perfect place for enjoying Mermaid Morning Bliss (MMM Bliss) coffee in the morning or cocktails in the evening. Partial view of Back River from front porch! Parking for 2 vehicles in the driveway. Perfect location: 4 blocks to Alley 3 (the main boat and Kayak launch area) the Back River Fishing Pier and 1 block from AJ's Dockside restaurant! This home is also 2 doors down from Back River Bungalow for multiple families to stay close together!! NOTE: AJ's Dockside restaurant overflow parking lot is located across the street in front of "Flips" Flop House. You're in the quiet Back River District of the island, yet close to everything! *Note: high cabinets in kitchen; step stool provided in laundry area to access cabinets. Rooms Sleeps 10, Room off of kitchen has a dining table & chairs and 2 daybeds with trundles and a small flat screen TV. Great place for kids' dining, napping and play! (no door separating this room from kitchen; there is a curtain between these 2 rooms). Charming house in great location. House in great condition and very clean. We enjoyed our weekend and would recommend a stay here. For best sunset go to 3rd Alley st, around the corner. For sunrise, just go to the beach. The Flips Flop house is very close to the beach and full of charm. It has plenty of space and a great kitchen. Our family vacation at this lovely home could not have been more relaxing. The house was large enough, close but not too close to the main streets. The screened porch hosted many meals and games. I cannot say enough nice things about this house and the management who made us feel so welcome. We enjoyed the history of the island and touring Savannah which was so close as well as wonderful seafood and beach time. What a fun memories we made there! Sweet place with plenty of room! Located across the street from the best place to see the sunset (AJ's). Fun tree in the yard that is ideal for fun photo. You won't miss it. Front porch and cushions could use a cleaning, but otherwise very clean and tastefully decorated. Thoughtful Thank you note and bag of coffee from the island. Thank you. See you again. a guest from MENDOTA HEIGHTS, MN does not recommend this vacation rental. While we loved the screened porch, the cottage itself was in poor shape. We had lamps and ceiling fans that didn’t work, dirty floors and an overall unkept appearance. Sheets and towels should be replaced. Also was not as well stocked as other cottages we’ve visited. We still had a great time and will be back next year, but will choose a different cottage. The flip flop house was the perfect house for our girls weekend! Everything was so cute and organized and it offered us everything we would need! Loved the rustic charm! This is our second vacation to Tybee. We had such a great time last year we decided to come back, but we needed a larger place. This adorable cottage was the perfect place for us. The screened in back porch was great for playing games and just relaxing. Our kids loved having their own rooms and access to the porch. Tybee is a special island. It's not overly commercialized and I always feel myself take a deep breath when we arrive. It's like the beach heals your soul! Our family had a great time at this cottage. The beds were really comfortable and the cottage was very clean. The screened in porch can be accessed from all three bedrooms and was a favorite spot to hang out when not at the beach. Although this cottage is about 1/2 mile or so from the beach, we rented bikes for the week and enjoyed the ride to the beach and around the island. The house had beautiful decor and great character. We recommend it and hope to go back again. This is a wonderful place to stay. The cottage is decorated beautifully and was very comfortable. It has everything you need, close to the water and places to eat. And I can't say enough about both porches,they are great. Our visit was very enjoyable. Our family had a great time. We've been to Tybee several times and this was by far the best stay. House is in a great spot close to back river with a nice side yard for the kids to play. Screened in porch is huge and was great for evenings away from the bugs. Would absolutely recommend. Flip Flop Cottage was amazing! Very vintage and beautiful! It fit all of us perfectly with room to spare. This is our 3rd yr staying with Mermaid Cottages and they just keep getting better and better! We will be back for sure! We used the cottage while in town for a wedding in Savannah. It was too short a time to fully enjoy the island. The house is nestled in a community and has everything needed. Our stay was short. But the house was beautiful, clean, and welcoming. We loved every second of our stay in our lovely mermaid cottage! Our Girl Scout Troop had a awesome time. They loved the house! Very comfortable and plenty of room for all 9 of us. It was the perfect location to go into Savannah and stay on the beach. I will definitely recommend to all my family, friends and GS troops! Thanks Mermaid Cottages! We will be back! Mermaid Cottages is the best! This was our 4th time staying on Tybee Island in a Mermaid Cottage. Flips Flop House was amazing. The location was perfect, close enough to ride bikes to the beach, across from AJ's and near all the shops. We enjoyed breakfast on the screened in porch and hanging out in the large and bright living room. I was a little nervous about the kitchen because the pictures make it look very small, but it is actually quite large, nice and new and had all the amenities we needed. The decorations and furniture were perfect and so beachy. We had a little issue with the refrigerator leaking and the Mermaids took care of it right away. They are awesome! Flips Flop House is the perfect beach vacation. We will for sure be back next year. House was well equiped, especially in kitchen. Nice side porch. Seemed a little run down, could use fresh paint. Also seemed a bit dark inside. We had a wonderful experience at the Flip Flop House. the area was peaceful. Everything was great. From the local eateries to the beach. The house was perfect and way more than anticipated. We will definitely be back! Happy you enjoyed our Flips Flop!! We love it when our guest have the kind of experience that brings them back to us again, over & over. See ya again soon. .......The Mermaids! This home was way more than we could have asked for. The side porch that has entries indoors to three of the bedrooms was our all time favorite feature. We spent many mornings and evenings here talking. Everything was clean and this one-of-a-kind house gave us all the charm we were looking for. It accommodated 10 people easily and comfortably. We will definitely consider another visit to the Flip's Flop house next time we are on Tybee!! a guest from Atlanta, GA does not recommend this vacation rental. We liked the screen porch a lot. They really need to repair the hot and cold faucets in the front bathroom because they move around and it's hard to wash hands. The pedestal sink should be repaired to look cleaner too. Several of the outlets didn't work, so we had to use the hair dryer in a different room. A couple of the night lights didn't' work either. Otherwise, I liked the house. A group of friends and myself rented this home while we were out on Tybee Island for a friend's wedding. The home was very spacious, clean, and the staff was very helpful, friendly, and professional. Great vacation home! We had a group of 6 and there was plenty of room. The decor was so bright and inviting. Working with Mermaid Cottages was a very pleasant experience. Will definitely book again in the future if visiting the area. They really went above and beyond to make sure our stay was comfortable and enjoyable! Flips Flop house is an amazing vintage cottage. We loved the backwater location. The cottage is spacious and we loved the screened in porch. Kitchen lacks abundant cupboard space and counter/prep surface but that wasn't a huge issue for us as we dined out a lot!! Our stay at the Flip flop house was great. Mermaid cottages was very accommodating and organized. All decorations were beautiful and the cottage was very homey. Our only comment was there was mold in the kitchen,but we heard there was recently a major storm and I am sure it will be taken care of! Would definitely use them again! Location is perfect. Lovely cottage for an amazing vacation!! The cottage was perfect. Great location and great amenities!! We had an absolutely wonderful time and plan on going back as soon as possible! Only thing I would change is ceiling fans on the screened in porch!! Mermaids were wonderful! We wouldn't think of using another rental agency!! I have to say that Mermaids is a most professional company!!! They have their act together and are the client is "in the know" before you arrive at their properties! Location was fine except a bit far from the beach. We thought the house could have been a bit cleaner especially bath floors, but overall it was fine. It was an adorable cottage...decorated so nicely!!! We enjoyed sitting on front porch talking to all the customers coming to A J's for dinner! We also liked just walking around the corner for a drink or dessert, at A J's, on several occasions while there. Lively place on the water! We had a great time here. We did have to call the management company to replace the blender and a light bulb and they were very quick to respond. It really was a wonderful experience from beginning to end. Nice rental property with cute furnishings. Location is across the street from AJ's, which is on the marsh side of Tybee. Description was accurate. Very well manitained. Very clean.Very good customer service.I would recommend this site to anyone looking to get away for a few days.J J's was out standing, food was excellent, service was great, and location was great. We rode our bikes to every where we wanted to go. Just a great overall experience . Our third Easter break on Tybee. I wouldn't stay anywhere on Tybee other than a Mermaid Cottage. We LOVED our stay at Mermaid Cottages. The house was perfect for our needs. There were six of us. The house is welcoming, charming, bright, inviting and comfortable. The kitchen was FULLY stocked with all needs met. Beds and sheets were very comfortable. The location could not have been better. Daily walks to the beach a few blocks away. Breakfast around the corner at AJ's. Quiet neighborhood and gorgeous sunsets. Would DEFINITELY stay there again!! Management called twice to make sure we were happy and were available if we needed anything! We could not have been happier! We thoroughly enjoyed the house and our stay. It met all our needs and made our vacation very pleasant. Mermaid was wonderful to work with. This house is in a great location, but anyone that plans to rent should know that the twin bedroom has no door, only a curtain to shield it from the kitchen. Also, one of the bathroom's shower head is hand held, not overhead. The kitchen is also very small and has only the barest minimum of amenities. BUT, great front porch that shields the wind and catches the afternoon sun, AND roomy living room and dining room. This is our second year coming to the 1/2 Marathon and staying at the Flip Flop house. We are all amazed at this house. We do not plan to stay anywhere else, other than the Flip Flop house. Comfortable house with lots of room. Loved the light fixtures, especially the ceiling fans. AJ's was right across the street and great for take out. Also enjoyed North Beach Bar and Grill. Communications with the Mermaids was helpful and fast. Very cute house, the outside of the house needs a little TLC. Flower beds were in need of weeding, yard needs some work. Loved Flopping here! Right around the corner from AJ's for breakfast/lunch, a short walk to the Back River and short drive to the main beach. Great porch to rock away the evening chatting. Conveniently located and fun home. The house was very clean and nice on the inside. We had 10 people stay and did not have any issues with dishes or bathrooms. The propane ran out and they were very prompt in replacing it for us. The house is close to the beach, IGA,and some nice restaurants. The twin beds are in a room together and the three queen beds were all in separate rooms. We also enjoyed the screened in back porch to eat dinner or just relax. Very nice rental for vacation. The property management called us to make sure we did not have questions or issues. I really dont want to share how fabulous this place is!! Location was wonderful, house was wonderful. Loved the charm and decor of the vintage home. Was called regularly to see if we had any needs. The only inconvenience is that AJ's parking does over flow into the yard almost nightly but we adapted to that quickly. The positives of this home truly out way that one minor inconvenience. We love this home and will be back for many years to come! Fantastic and so easy! Location was perfect, working with the company was convenient/worry-free and this is honestly one of the cutest little beach houses ever! Loved our stay at the Flip Flop House. Everything we needed and more. We had an amazing vacation and the Flips Flop house was Awesome!! It was very clean when we arrived and the people at Mermaid Cottages are wonderful!! They called us when the house was ready and even checked in on us the next day. The whole house is very spacious and the screen porch is great, the only thing that the porch needs are ceiling fans. The beach was just a short car ride and AJ'S was very good. We had an amazing vacation and will definitely be booking for next year very soon!! Thanks for everything!! Our family (10 of us) came down to spend a few days to attend the SCAD graduation. It was a great location to get back and forth to Savannah and to the beach. The house was great. Plenty of stuff for all of us, grilled out 2 days, sat on the porches, took naps and all of those important vacation activities. House was beautiful and roomy! Great house and great location! We love Tybee Island! We had an amazing vacation this house was perfect. There were eight of us and it was completely comfortable. The screened in porch is amazing used it every night! Beautifully decorated and we even met the owner what a nice guy. Flip's Flop house was perfect for our vacation. Lots of space - 3 queen beds, the 2 day beds which had 2 trundle beds under them - and the house was beautiful. We didn't feel like there was a ton of traffic from AJ's across the street and the beach was close. We recommend the south end of the beach where the sand is very soft. We were a group of 8 ladies that came to Savannah to run the 1/2 marathon. I had heard how great this house was from my daughter, that had stayed here for a bachelorette party. We were in awe of the decor! It was "perfect" for our group and we hope to stay here again next year. We had a wonderful time and a fabulous experience renting from Mermaid Cottages. I was looking for a rental that would allow our family to stay together for a family wedding. They went above and beyond to make sure that we had a great experience. The Flip Flop house was perfect. It had plenty of space for all to crash and wonderful porches to hang out on! We were only going to be there for a short time and Jan arranged for us to check in a bit early and then allowed us to leave late! Thank you Jan!! With our crowd being older and scattered family time is precious. You made our trip a memory and that was exactly what I was hoping for! Great Experience!! I traveled with a group of 9 girls for a bachelorette weekend getaway. We had such a fantastic time at the Flip Flops House. The cottage was so beautifully decorated and so very clean. Everything we needed was there for us. Check-out was a breeze. I am now anxious to try other Mermaid cottages when I come back to Tybee with my family! We absolutely loved staying in the Flips Flop House. It accommodated all 9 of us so nicely. We loved the location of the house, the decor, and the screened in porch. Our AC was not working so we called the 24/7 number to come fix it while we were out at dinner and when we came back the AC was back on. The hospitality we received was excellent. We were sad to leave. We will recommend the Mermaid Cottages to everyone. We had such a great time during our stay on Tybee Island! The Flips Flop house was great! The staff was super nice and helpful!! The house was clean and very kid friendly! I have read the other reviews about the "nuisance" of AJ's parking lot... Rarely did we ever see or hear people across the street! The back porch is the place to be anyway!! Thanks for a great stay and wonderful vacation! Definitely visiting again soon!! I was very satisfied with my rental experience. The Flips Flop house was very charming and comfortable. I really liked the easy check-in because we did not have to go to another location first. was a very pleasant stay. How do we begin to describe the wonderful time we had during our week at Tybee Island staying in Flips Flop? This was our third time staying in a Mermaid Cottage property and as in the previous two times we were so very pleased. The house was wonderful, clean and had everything we needed to make our stay perfect.All the rooms were so beautifully staged. We all commented on the comfort of the beds and how well we slept each night. We enjoyed the access to the screened in porch from the bedrooms. It was wonderful to sit out there early in the morning and enjoy our coffee or to gather for conversation or games. The location of the house was perfect for us. We enjoyed being just an easy walk to the beach to enjoy the sunrise and the short walk to the back river to enjoy the sunset. We felt the area was quiet and very family friendly. There were five adults and two children in our group.The flow of the house was wonderful and allowed plenty of space for all of us. One of the adults in our group needed a wheelchair and there were no problems moving around in the house at all. We loved the short walk to AJ's and to Stingrays for wonderful seafood. The laundry room was a great place to come in from the beach and leave your wet towels before entering the house. We also enjoyed the convenience of the outdoor shower. The owners have made their home a wonderful place for families to come and feel at home while staying there. We are already trying to decide what week we will be going next year to stay in this same house! I highly recommend this home for any family wanting an excellent place to stay during their visit to Tybee Island. Very relaxing. House convenient to everything we needed. Very pleasant. Needed night lights. Needed blender that crushes ice. We've found our place on Tybee Island! I have visited Tybee several times, staying at many different properties, but I can stop looking for the perfect house now, because Flip's Flop House is it! This house was charming. Perfect beachy decor, very tastefully done. It looks like no expense was spared when it was restored. It has so much more room than it appears from the outside, too. Our group of two adults and two teenagers had plenty of space to get away, and the house could easily accommodate several more. We prefer a quieter location on the island and this was perfect for that. Some reviews mentioned the AJ's parking as an issue but it didn't bother us at all. We especially liked the outdoor shower and the beautifully decorated screened porch. The only thing that could have made the porch better would be to add a ceiling fan or two, as it was very hot and humid during our visit. We can't wait to go back and will plan to stay at this house again. Excellent customer service from Mermaid Cottages staff as well. Very nice home.Spacious and private. Clean and a great location. Office staff extremely courteous and allowed us to use driveway prior to check in so we could go to beach and not pay for parking. Within walking distance to both oceanfront and Back River. Great place to bring family and friends. When we walked in the house was perfect and we fell in love with it instantly! This place was absolutely gorgeous!! Everything we needed was there for us and the home was very relaxing! The beach is not a far walk and there are some shops not too far as well that we enjoyed going to. We even had an accident and the maintenance was quick to have someone come out! We look forward to booking again with Mermaid Cottages!!! Mermaid Carol was awesome in helping with everything and is a very sweet lady!! We stayed here for my 30 th bday this past weekend! Loved the house... It was perfectly decorated and very cozy! Would love to stay there again! From the moment we decided to go to Tybee we started working with Mermaid Carol and it was a wonderful experience. She listened to our needs and got us the best property. The property was a little piece of heaven. It was so nice. I cannot say enough about this place or mermaid cottages it was just perfect! We very much enjoyed the house's spaciousness and the amenities, especially the large screened porch, and the location was great for access to the back beach and the beautiful marsh sunsets. Dream cottage get away - perfect for our family this Easter! 2nd time to rent from the Mermaids & this was better than the last! I thought our last cottage was cute, but this was so adorable! Love it! a beautiful place to unwind. Very friendly staff that made sure all of our needs were taken care of, Tari even stopped by to welcome us and point out places of interest. Very kind. The Weil-Atkinson House was great! We enjoyed staying in such a historic and comfortable house. The location was close to everything. The staff of Mermaid Cottages was amazing throughout the entire booking process and were extremely helpful with restaurant recommendations and making sure our stay was truly special! Thanks Mermaids!!!! Would defo book again. Easily sleeps 4-6 adults. Wonderful space for relaxing and getting away from the world. We had a wonderful stay at the beautifully renovated Weil-Atkinson house! We cooked most of our meals in and would have found it helpful to have some kind of shelving/pantry area to store food and some more basic spices for our use. The house and property are gorgeous. The only critique is that the view from the front porch is of overflow parking for AJs Dockside restaurant. 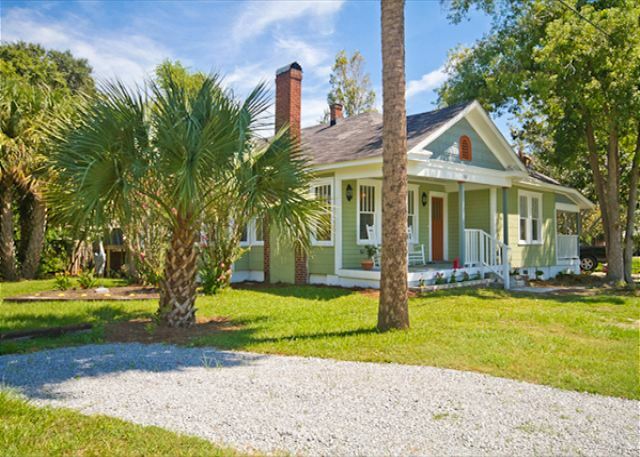 This is a lovely cottage on Tybee, renovated and restored with beautiful furnishings from years past. The cottage has a brand new kitchen as well as washer and dryer. 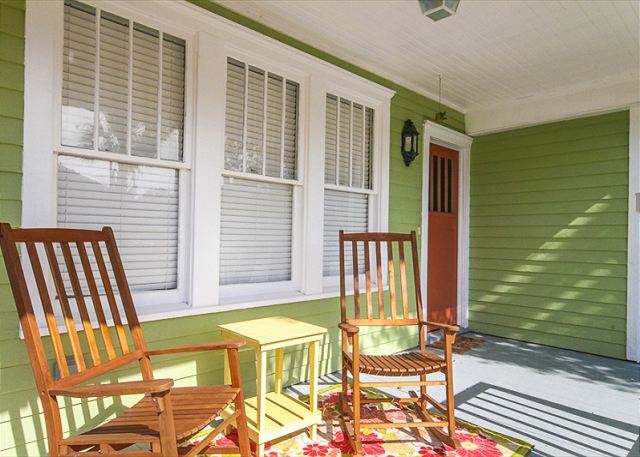 All 3 bedrooms have french doors that open to an amazing side porch. Great location on the back river, with a short bike ride to the beach down 14th street or on Chatham. AJ's Dockside is next door and their parking lot is across the street from this property. However, no issues and very quiet. You have some privacy on the side porch, the restaurant closes at 10.00pm. Thank you, Mermaid Cottages for a wonderful vacation! Your company provided outstanding service from beginning to end. Already thinking about a return trip next year and Mermaid Cottages will be our first call. The staff a Mermaids Cottages was AMAZING. Overall a top notch experience. House was beautiful and in perfect condition with everything we could have asked for. Friendly courteous very helpful staff, I highly recommend this company and their properties. The location of the cottage is great! It fit our group of 7 very well and was very clean. We hope to return in the future. Wonderful place too bad more places in Tybee don't look like this cottage. We have rented beach houses all over the country and this was by far the best in terms of cleanliness, quality, and decor. It's much bigger than it looks online and the huge side porch was a favorite gathering place. It was the perfect extended family entertaining spot. I was worried about AJ's restaurant being so close since we like quiet and secluded, but there were no issues there. The parking lot across the street is busy with people coming in and out and walking by, but they don't linger, they don't park in the yard, and they're all gone by 10:00. The side porch is somewhat blocked from the street by trees, so we didn't feel exposed at all. Bottom line - great house, wonderful rental company, would not hesitate to rent this same house over and over again. I wish we could just move in for good - we loved the house that much. Charming home - perfect location! Overall a very nice experience. Cottage was clean and well thought out. However, we may choose another cottage next time because of the close proximity to AJ's restaurant/bar and the accompanying noise later at night. And it would be nice if next time we had a marsh view. Still, we had a great time. Beautiful house; best rental agency! The Weil-Atkinson house is a lovely Tybee home; well furnished and renovated to its former glory. Mermaid Realty is an outstanding property management group. They helped us in a difficult situation and could not have been more accommodating. This was our 2nd experience renting through them and both times we have been totally satisfied with the cottage and their management. Few of us went down for the Music festival. Stayed on Tybee Island in wonderful little house. Great time, clean and newly redone 1927 home. Loved the time there. The web pictures are cute, but in person this cottage is even better. It's actually very spacious inside and our family of five had lots of places to relax. The home is super clean and has been newly renovated. You'll feel like you are in a new home. It is in a great location, within walking distance of the beach, pier, shops and restaurants. We can't wait to return. The Mermaid staff is wonderful and very attentive. The Weil Atkinson Cottage is charming--inside and out. Furnishings are simple and tasteful. Everything is very clean. We visited right after Christmas and the cottage was decorated for the season with Christmas tree and other items. A very cozy retreat. We will definitely visit again. Thank you, Mermaid Cottages (and owner) for giving us a great get-a-way! We enjoyed Tybee Island and our stay with you. Your recommendation on Tims bicycle was appreciated. The gentleman that came to get the internet working did a good job, prompt and followed up. The TV above the fireplace was a mystery to operate. Bikes were way better than TV anyway.